Every summer, news feeds fill up with pool safety stories that aim to teach adults how to spot when a child is in trouble in the water before it's too late. These sorts of safety tutorials aren't generally meant for children. However, in Orlando, Florida, last week, a pair of 6-year-old twin brothers, Peyton and Bryant Switzer, proved that they didn't need a primer to spot a fellow child drowning. They just knew and sprung into action. 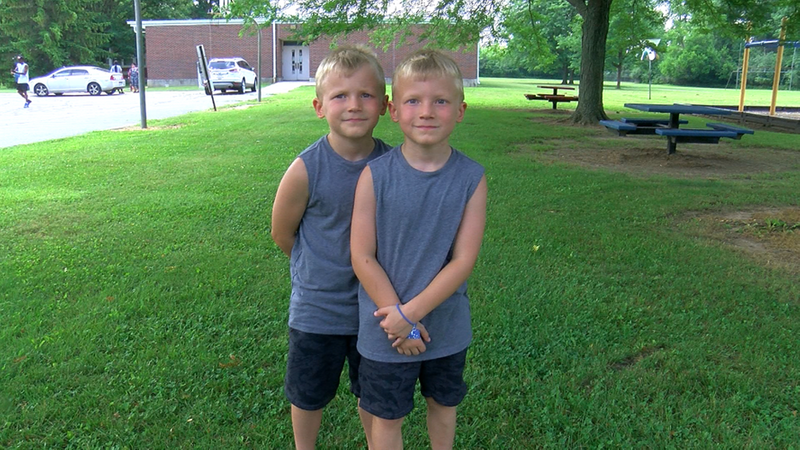 The twins live in Ohio, where their mother, Amy Walters, and her fiancé, DJ Deiter, work for a financial services organization called Modern Woodmen Fraternal Financial. When the couple learned that their national sales convention was taking place in Orlando this summer, they decided to take along the twins -- the youngest of five brothers -- for a Disney World vacation. "We went down a day early and stayed at a hotel near the airport," Walters told CBS News. "With our late evening arrival, we wanted to let the boys chill out and swim before we had to check into the sales convention hotel. ... They are like little fish and would live in the water if you'd let them." So Peyton and Bryant -- who "have a very strong twin bond and are almost always together," their mom said -- were enjoying themselves at the hotel pool, where a few adults were luxuriating in a nearby hot tub and another mother and her 3-year-old daughter, named Charlie, were playing in the shallow end. As the day turned to evening, Walters recalls that the boys showed no signs of wanting to stop. "As always, the boys wanted to stay and swim longer," she told CBS News. "So DJ said he would stay down with them and I could go pack things up and get ready to head to the convention hotel." That's when Charlie's mom began packing up her family's things as well, briefly turning her back to the pool. She didn't immediately see it when little Charlie ran over to the deep end, where Bryant and Peyton were playing, and jumped in. The toddler quickly began struggling to keep her head above water and the twins could tell that she was in trouble, as her head began disappearing beneath the surface. "Without thinking twice, Peyton jumped in and swam over to her," says Walters. "He wrapped his arm around her and swam her over to the ladder, where Bryant was. Bryant then helped her up the ladder to where her mother and DJ had come over to help pull her up." It was an instance of quick thinking and bravery that likely saved the little girl's life from a type of accident that is, sadly, all too common. According to the Centers for Disease Control and Prevention, drowning is the second-leading cause of accidental deaths in kids under the age of 15. Just last month, U.S. Olympic skier Bode Miller's 19-month-old daughter drowned in a swimming pool accident, when she wasn't immediately located and couldn't be revived after stumbling into the water. So both Charlie and the twins' mothers are gravely aware that this story could have easily gone the other way. For that reason, the young Switzer boys are now being hailed as heroes. "We have received lots of calls, texts and messages from family, friends, coworkers, the twins' and their brothers' current and past teachers and coaches, clients and community members who have seen the story all over the U.S.," says Walters. "They have even forwarded messages from others that were sent to them from people we don't even know. ... Even our local firefighters and policemen and women were excited and told them they saw them on TV." Last Monday, the boys each received an award from the Ohio State House of Representatives, presented by District 3 State Representative Theresa Gavarone after their swimming lessons at the Bowling Green City Pool. "They have been getting lots hugs and high fives everywhere we go," says Walters. "They are very proud of what they did and are gracious for all of the recognition and accolades and beam from ear to ear, but have remained humble and know they did the right thing, just like anyone should when someone is struggling."